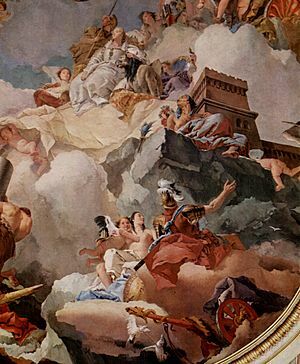 Giovanni Battista Tiepolo (March 5, 1696 – March 27, 1770) was an Italian decorative painter of the Baroque. He was born in Venice and died in Madrid. He sired nine children upon his wife Maria Cecilia Guardi. Two of his three sons became his assistants; the third became a priest. He worked churches and palaces in Italy, Germany, and Spain. Massiva (the nephew of a prince of Numidia) being released after capture by Scipio Africanus  . Walters Art Museum. Giovanni Battista Tiepolo Facts for Kids. Kiddle Encyclopedia.